Asthmapolis: Why Can’t Inhaler Sensor Be Adapted For Diabetes and Insulin Pens? Asthmapolis, which launched in 2010, has been in the news the last few days after announcing a $5 million series A venture capital round of funding. They are an innovative mHealth company that is focused on improving care of asthma through a combination of hardware and software. They developed a small sensor that attaches to the top of an asthma inhaler and wirelessly synchs with your smartphone. The data can then be tracked, viewed, analyzed, sent to a physician, used for clinical research, etc. Anything you can imagine. The frequency with which someone uses their inhaler is often directly tied to how severe their asthma is, and can predict which people are headed for trouble. So, rather than each squirt of an inhaler being an invisible act lost to history, it can now be tracked and used to generate meaningful data to help patients (and for research). This is exactly what mHealth is all about. The innovators at Asthmapolis have developed a relatively simple and straightforward intervention that should add no additional hassle to a patient’s life but might be life-saving if it can serve as an early-warning system for worsening asthma. Taking this one step further, we need to have such an add-on piece of hardware for insulin pens for use by people with diabetes. It is obviously not exactly the same: with an asthma inhaler, one press is one dose, whereas with an insulin pen, it would have to be able to capture the exact amount given; with asthma, an increasing use of an inhaler could be a sign of impending trouble, whereas with diabetes, daily fluctuations in insulin dose can often be a normal pattern. However, there are enough important parallels that make this an invention that we need in the diabetes world. We are always asking our patients to keep track of how much insulin they use, but it is an extra task for them in their already busy lives, one which could relatively easily be automated. 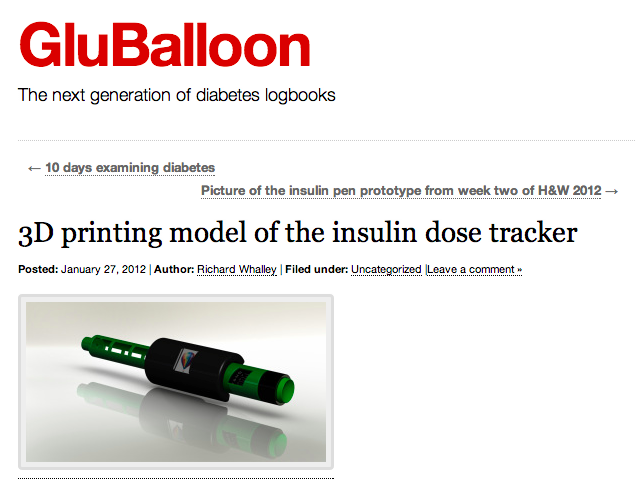 I’ve still yet to see a prototype of such a device for an insulin pen outside of the GluBalloon project from MIT about a year ago. 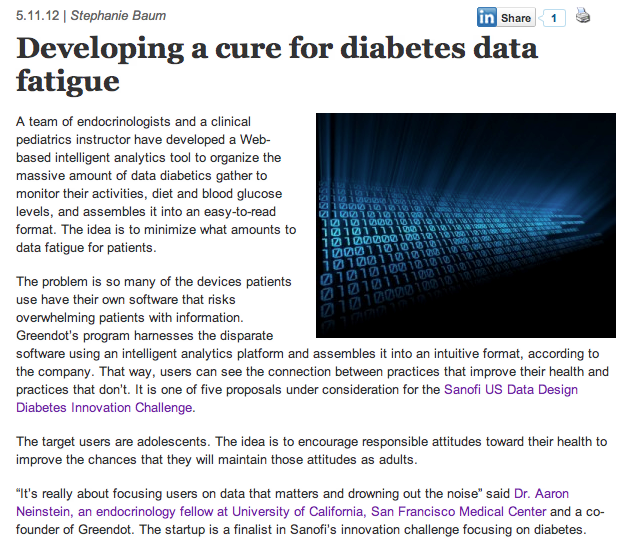 I hope that there is more to come in the near future for us in the world of diabetes. 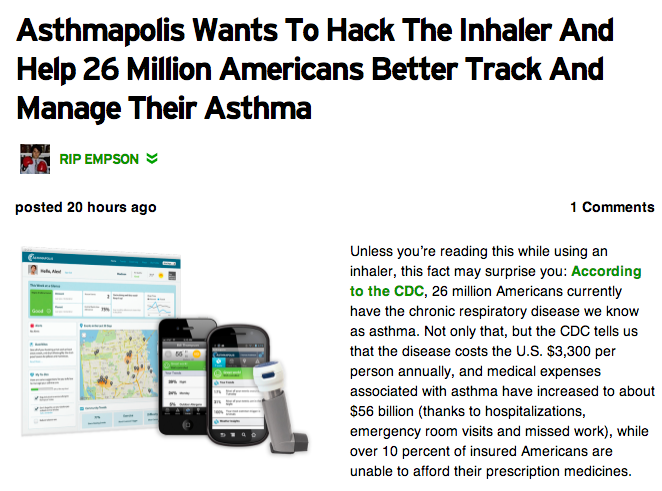 Best of luck to Asthmapolis… they look to be poised to make a major difference in the lives of people with asthma. Posted on April 5, 2013 December 12, 2013 Categories Digital HealthTags Asthma, Asthmapolis, diabetes, Diabetes mellitus, digital health, mhealth1 Comment on Asthmapolis: Why Can’t Inhaler Sensor Be Adapted For Diabetes and Insulin Pens? Story at DiabetesMine about Diabesties.